After posting a 1-9 season in his first year as head coach, Ludlowe’s Mitch Ross had the Falcons off to a 3-1 start in 2018. FAIRFIELD - Brian Howell was through. He was done with football. It had been a miserable season, ten games, ten losses. None of those ten defeats even remotely close. As a sophomore, he saw the seniors, including his older brother, Chris, at odds with the coaching staff - even to the point of the players boycotting a practice after a blowout loss to Greenwich. Once, the game had been fun. Now, it was anything but. 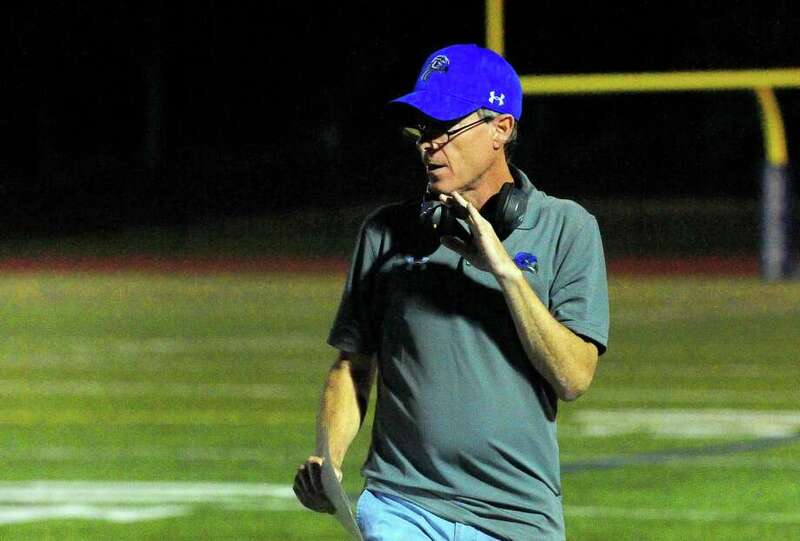 Even when the old Ludlowe coaching regime was sent packing and a new staff, headed by Darien assistant Mitch Ross, came in last year, Howell did not play. The pain and disappointment of that 0-10 season was still festering like an open sore. But last season, a season where the Falcons went 1-9, something interesting happened. Players started talking about the changes that had come under Ross’ watch. It was taking time, but football was becoming fun again, slowly, but surely. Kids were talking to their friends, telling them, check us out, come on out. Give football another chance. So, some of them did. It was the first step. And bringing back some of that old Falcons fire. When and where the conversation took place, is moot, but at some time last season, Ross went out looking for Howell. A talented athlete, Ross knew what Howell could bring to the program. Ross needed Howell. When he found him, he gave him the sales pitch. Howell and Northrup, along with quarterback Colin Wilson and the rest of the Falcons’ seniors - Aidan Wykoff, Kevin Quinn, Jake Simonelli, Thomas Stasko, Thomas Murray, Oliver Lay, Victor Cunha, Derek Tallman, PJ Egan, Ryan Lilly, Robbie DuToit, Isaiah Smith, John Palmeri, Neftali Gomez. Jeff Beauvais and Alan Gutierrez - have not only embraced Ross’ coaching techniques but have turned the Ludlowe program completely around. Heading into tonight’s game at Taft Field against Trinity Catholic, the Falcons are 3-1. The last time a Ludlowe team started that fast was back in 2014. When was the last time a Ludlowe team started 4-1? Best guess is the mid- to late-1980’s when it was Roger Ludlowe High School. Especially Ross. When he came to Ludlowe, he immediately changed everything. No negativity. No yelling. No swearing. No hard contact, in fact, no contact period. No after practice running. When you’re running close to 200 plays in practice, chasing after the ball wherever it stops, that’s more than just a workout. “That was part of my recruiting pitch, change the whole atmosphere,” Ross said. “I hired a great coaching staff, who I was very clear with that I expected there would be no yelling on the football field. Yes, we would teach them, yes, we would be constructively critical at times, but we would never yell at a kid, we’d never pull a kid off the field when he made a mistake. Last season, there were around 35 to 40 kids in the Ludlowe program. This season, including the freshmen and JV teams, there are over 100 kids playing football. Two weeks ago, the Falcons fell behind Norwalk 21-0 and trailed 28-15 at halftime. Past Ludlowe teams likely would not have come back from a two-touchdown deficit. But this is a different Ludlowe team. Howell scored three touchdowns and threw a 59-yard pass to Wykoff that brought the ball to the Bears one-yard line to set up the go-ahead touchdown and two-point conversion with just over a minute left in what ended up being a 43-42 Falcons win. Overall, Ludlowe accounted for 553 yards of total offense with Wilson completing 20 of 32 passes for 248 yards. Last week, the Falcons went to overtime but managed to knock off Brien McMahon 28-27. Wilson threw two TD passes, including a 65-yarder to Howell and Northrup scored both overtime touchdowns with Cunha’s fourth extra point kick the deciding play. This week, the Falcons have a chance to do something that hasn’t happened in over 30 years. Don’t think that they don’t know what they’re playing for. “We’re having a blast,” Northrup said. Winning will do that. Winning. That’s a word - and a feeling - that hasn’t been felt around the Ludlowe program for a long, long time.